Anti-Russian Ukrainians allegedly helped coordinate and execute a campaign against Trump in partnership with the Democratic National Committee and news reporters. A Yemen-born ex-British spy reportedly delivered political opposition research against Trump to reporters, Sen. John McCain, and the FBI; the latter of which used the materialin partto obtain wiretaps against one or more Trump-related associates. There were orchestrated leaks of anti-Trump information and allegations to the press, including by ex-FBI Director James Comey. The U.S. intel community allegedly engaged in questionable surveillance practices and politially-motivated unmaskings of U.S. citizens, including Trump officials. Alleged conflicts of interests have surfaced regarding FBI officials who cleared Hillary Clinton for mishandling classified information and who investigated Trumps alleged Russia ties. But its not so easy to find a timeline pertinent to the investigations into these events. U.S. intel community vastly expands its surveillance authority, giving itself permission to spy on Americans who do nothing more than mention a foreign target in a single, discrete communication. Intel officials also begin storing and entering into a searchable database sensitive intelligence on U.S. citizens whose communications are accidentally or incidentally captured during surveillance of foreign targets. Prior to this point, such intelligence was supposed to be destroyed to protect the constitutional privacy rights the U.S. citizens. However, its required that names U.S. citizens be hidden or masked even inside U.S. intel agencies to prevent abuse. June 2013: FBI interviews U.S. businessman Carter Page, whos lived and worked in Russia, regarding his ongoing contacts with Russians. Page reportedly tells FBI agents their time would be better spent investigating Boston Marathon bombing (which the FBIs Andrew McCabe helped lead). Page later claims his remark prompts FBI retaliatory campaign against him. The FBI, under McCabe, will later wiretap Page after Page becomes a Donald Trump campaign adviser. FBI secretly records suspected Russian industrial spy Evgeny Buryakov. Its later reported that Page helped FBI build the case. Ukrainian-American Alexandra Chalupa, a paid consultant for the Democratic National Committee (DNC), begins researching lobbyist Paul Manaforts Russia ties. for her campaign to become a Democrat state Senator in Virginia. The fact of the McAuliffe-related donations to wife of FBIs McCabewhile FBI was investigating McAuliffe and Clintonlater becomes the subject of conflict of interest inquiry by Inspector General. March 4, 2015: New York Times breaks news about Clintons improper handling of classified email as secretary of state. In internal emails, Clinton campaign chairman (and former Obama adviser) John Podesta suggests Obama withhold Clintons emails from Congressional Benghazi committee under executive privilege. it looks like [President Obama] just said he found out [Hillary Clinton] was using her personal email when he saw it on the news. Clinton aide Cheryl Mills responds, We need to clean this up[President Obama] has emails from Clintons personal account. May 19, 2015: Justice Dept. Assistant Attorney General for Legislative Affairs Peter Kadzik emails Clinton campaign chairman John Podesta from a private Gmail account to give him a heads ups involving Congressional questions about Clinton email. Oct. 2015: President Obama uses a confidentiality tradition to keep his Benghazi emails with Hillary Clinton secret. Justice Dept. associate deputy attorney general Bruce Ohr meets with Fusion GPS Christopher Steele, the Yemen-born ex-British spy leading anti-Trump political opposition research project. January 2016: Democratic operative Ukrainian-American Chalupa tells a senior Democratic National Committee official that she feels theres a Russia connection with Trump. McCabe takes lead on Clinton probe even though his wife received nearly $700,000 in campaign donations through Clinton ally Terry McAuliffe, whos also under FBI investigation. March 2016: Clinton campaign chair John Podestas email gets hacked. Carter Page is named as one of the Trump campaigns foreign policy advisers. March 25, 2016: Ukrainian-American operative for Democratic National Committee (DNC) Chalupa meets with top Ukrainian officials at Ukrainian Embassy in Washington D.C. to expose ties between Trump, top campaign aide Paul Manafort and Russia, according to Politico. Chalupa previously worked for the Clinton administration. With DNCs encouragement, Chalupa asks Ukrainian embassy to arrange meeting with Ukrainian President Petro Poroshenko to discuss Manaforts lobbying for Ukraines former president Viktor Yanukovych. The embassy declines to arrange meeting but becomes helpful in trading info and leads. Ukrainian embassy officials and Democratic operative Chalupa coordinat[e] an investigation with the Hillary team into Paul Manafort, according to a source in Politico. This effort reportedly includes working with U.S. media. April 2016: Theres a second breach of Democratic National Committee computers. Washington Free Beacon breaks off deal with Glenn Simpsons Fusion GPS for political opposition research against Trump. Around this time, the FBI begins drafting Comeys remarks closing Clinton email investigation, though Clinton had not yet been interviewed. April 12, 2016: Ukrainian parliament member Olga Bielkova and a colleague meet with Sen. John McCain associate David Kramer with the McCain Institute. Bielkova also meets with Liz Zentos of Obamas National Security Council, and State Department official Michael Kimmage. April 26, 2016: Investigative reporter Michael Isikoff publishes story on Yahoo News about Paul Manaforts business dealings with a Russian oligarch. Justice Department Inspector General confirms its looking into FBIs Andrew McCabe for alleged conflicts of interest in handling of Clinton and Gov. McAuliffe probes in light of McAuliffe directing campaign donations to McCabes wife. June 2016: Fusion GPS Glenn Simpson hires Yemen-born ex-British spy Christopher Steele for anti-Trump political opposition research project. Steele uses info from Russian sources close to Putin to compile unverified dossier later provided to reporters and FBI, which the FBI uses to obtain secret wiretap. June 15, 2016: Guccifer 2.0 publishes first hacked document from Clinton campaign chair John Podesta. June 20, 2016: Christopher Steele proposes taking some of Fusion GPS research about Trump to FBI. The National Anti-Corruption Bureau of Ukraine signs evidence-sharing agreement with FBI and will later publicly release a ledger implicating Paul Manafort in allegedly improper payments. June 30, 2016: FBI circulates internal draft of public remarks for FBI Director Comey to announce closing of Clinton investigation. It refers to Mrs. Clintons extensive use of her personal email, including from the territory of sophisticated adversaries, and a July 1, 2012 email to President Obama from Russia. The draft concludes its possible that hostile actors gained access to Clintons email account. Attorney General Lynch tells FBI she plans to publicly announce that shell accept whatever recommendation FBI Director Comey makes regarding charges against Clinton. July 1, 2016: Under fire for meeting with former President Clinton amid the probe into his wife, Attorney General Lynch publicly states shell accept whatever FBI Director Comey recommendswithout interfering. July 2, 2016: FBI official Peter Strzok and other agents interview Clinton. They dont record the interview. Two potential subjects of the investigation, Cheryl Mills and Heather Samuelson, are allowed to attend as Clintons lawyers. July 5, 2016: FBI Director Comey recommends no charges against Clinton, though he concludes shes been extremely careless in mishandling of classified information. Comey claims he hasnt coordinated or reviewed his statement in any way with Attorney General Lynchs Justice Department or other government branches. They do not know what I am about to say, says Comey. Fusion GPS Steele, an ex-British spy, approaches FBI with allegations against Trump, according to Congressional investigators. July 10, 2016: Democratic National Committee (DNC) aide Seth Rich, reportedly a Bernie Sanders supporter, is shot twice in the back and killed. Police suspect a bungled robbery attempt, though nothing was apparently stolen. Conspiracy theorists speculate that Richnot the Russians had stolen DNC emails after he learned the DNC was unfairly favoring Clinton. The murder remains unsolved. Obama national security adviser Susan Rice begins to show increased interest in National Security Agency (NSA) intelligence material including unmasked Americans identities, according to news reports referring to White House logs. July 22, 2016: WikiLeaks begins publishing hacked Democratic National Committee emails. WikiLeaks Julian Assange denies the email source is Russian. Fusion GPS Christopher Steele, a British citizen, briefs FBI leadership on his anti-Trump political opposition research. Weeks later, the info makes it to FBI agent Peter Strzok and his team, according to New York Times. Aug. 15, 2016: CNN reports the FBI is conducting an inquiry into Trump campaign chair Paul Manaforts payments from pro-Russia interests in Ukraine in 2007 and 2009. Ukrainian parliament member Sergii Leshchenko holds news conference to draw attention to Paul Manafort and Trumps pro-Russia ties. Sept. 13, 2016: The nonprofit First Draft, funded by Google, whose parent company is run by major Hillary Clinton supporter and donor Eric Schmidt, announces initiative to tackle fake news. It appears to be the first use of the phrase in its modern context. Sept. 23, 2016: Its revealed that Justice Department has granted five Clinton officials immunity from prosecution: former chief of staff Cheryl Mills, State Department staffers John Bentel and Heather Samuelson, and Clinton computer workers Paul Combetta and Brian Pagliano. Sept. 25, 2016: Trump associate Carter Page writes letter to FBI Comey objecting to the so-called witch hunt involving him. Sept. 27, 2016: Justice Department Assistant Attorney General of National Security Division John Carlin announces hes stepping down. He was former chief of staff and senior counsel to former FBI director Robert Mueller. End of Sept. 2016: Fusion GPS Glenn Simpson and Christopher Steele meet with reporters, including New York Times, Washington Post, Yahoo News, the New Yorker and CNN or ABC. One meeting is at office of Democratic National Committee general counsel. Early October 2016: Fusion GPS Christopher Steele, the Yemen-born author of anti-Trump dossier, meets in New York with David Corn, Washington-bureau chief of Mother Jones. Oct. 3, 2016: FBI seizes computers belonging to Anthony Weiner, who is accused of sexually texting an underage girl. Weiner is married to top Hillary Clinton aide Huma Abedin. FBI learns there are Clinton emails on Weiners laptop but waits several weeks before notifying Congress and reopening investigation. Oct. 14, 2016: FBI head of counterespionage Peter Strzok emails his mistress FBI attorney Lisa Page discussing talking points to convince FBI Deputy Director Andrew McCabe to persuade a high-ranking Dept. of Justice official to sign a warrant to wiretap Trump associate Carter Page. The email subject line is Crossfire FISA. Crossfire Hurricane was one of the code names for four separate investigations the FBI conducted related to Russia matters in the 2016 election. At a minimum, that keeps the hurry the F up pressure on him, Strzok emailed Lisa Page less than four weeks before Election Day. Mid-Oct. 2016: Fusion GPS Steele again briefs reporters about Trump political opposition research. The reporters are from the New York Times, the Washington Post, and Yahoo News. Oct. 19, 2016: Ex-British spy Christopher Steele writes his last memo for anti-Trump dossier political opposition research provided to FBI. The FBI reportedly authorizes payment to Steele. Fusion GPS has reportedly paid him $160,000. Oct. 24, 2016: Benjamin Wittes, confidant of FBI Director James Comey and editor-in-chief of the blog Lawfare, writes of the need for an insurance policy in case Trump wins. Its the same phrase FBI officials Lisa Page and Peter Strzok had used when discussing the possibility of a Trump win. Obama intel officials orally inform Foreign Intelligence Surveillance Court of an earlier Inspector General review uncovering their significant noncompliance in following proper 702 procedures safeguarding the National Security Agency (NSA) intelligence database with sensitive info on US citizens. Late Oct. 2016: Fusion GPS Steele again briefs reporter from Mother Jones by Skype about Trump political opposition research. Oct. 28, 2016: FBI Director Comey notifies Congress that hes reopening Clinton probe due to Clinton emails found on Anthony Wiener laptop several weeks earlier. Oct. 30, 2016: Mother Jones writer David Corn is first to report on the anti-Trump dossier, quoting unidentified former spy, presumed to be Christopher Steele. FBI general counsel James Baker had reportedly been in touch with Corn but Corn later denies Baker was the leaker. Obama National Security Adviser Susan Rices interest in NSA materials accelerates, according to later news reports. Nov. 10, 2016: Emails imply top FBI officials, including Peter Strzok, Andrew McCabe and Bill Priestap engaged in a new mission to scrub or research lists of associates of President-elect Trump, looking for potential derogatory information. Nov. 18-20, 2016: Sen. John McCain and his longtime adviser, David Krameran ex-U.S. State Dept. officialattend a security conference in Halifax, Nova Scotia where former UK ambassador to Russia Sir Andrew Wood tells them about the Fusion GPS anti-Trump dossier. (Kramer is affiliated with the anti-Russia Ukraine Today media organization). They discuss confirming the info has reached top levels of FBI for action. Nov. 28, 2016: Sen. McCain associate David Kramer flies to London to meet Christopher Steele for a briefing on the anti-Trump research. Afterward, Fusion GPS Glenn Simpson gives Sen. McCain a copy of the dossier. Steele also passes anti-Trump info to top UK government official in charge of national security. Sen. McCain soon arranges a meeting with FBI Director Comey. Late Nov. 2016: Justice Dept. official Bruce Ohr officially tells FBI about his contacts with Fusion GPS Christopher Steele and about Ohrs wifes contract work for Fusion GPS. Dec. 2016: Text messages between FBI officials Strzok and Page are later said to be lost due to a technical glitch beginning at this point. Dec. 8 or 9, 2016: Sen. John McCain meets with FBI Director Comey at FBI headquarters and hands over Fusion GPS anti-Trump research, elevating the FBIs investigation into the matter. The FBI compiles a classified two-page summary and attaches it to intel briefing note on Russian cyber-interference in election for President Obama. Hillary Clinton and Democratic operative David Brock of Media Matters announces hes leaving board of Citizens for Responsibility and Ethics in Washington (CREW), one of his many propaganda and liberal advocacy groups, to focus on fake news effort. Brock later claims credit privately to donors for convincing Facebook to crack down on conservative fake news. Dec. 15, 2016: Obama intel officials incidentally spy on Trump officials meeting with the United Arab Emirates crown prince in Trump Tower. This is taken to mean the government was wiretapping the prince and happened to capture Trump officials communicating with him at Trump Tower. Identities of Americans accidentally captured in such surveillance are strictly protected or masked inside intel agencies for constitutional privacy reasons. Obama National Security Adviser Susan Rice secretly unmasks names of the Trump officials, officially revealing their identities. They reportedly include: Steve Bannon, Jared Kushner and Lt. Gen. Michael Flynn. State Department releases 2,800 work-related emails from Huma Abedin, a top aide to Hillary Clinton, found by FBI on laptop computer of Abedins husband, former Rep. Anthony Weiner. Jan. 2017: According to CNN: a wiretap reportedly continues against former Trump campaign chair Paul Manafort, including times he speaks to Trump, meaning U.S. intel officials could have accidentally captured Trumps communications. Justice Dept. Inspector General confirms its investigating several aspects of FBI and Justice Department actions during Clinton probe. Justice Dept. official Peter Kadzik, who tipped off Clinton campaign regarding Congressional questions about her email, leaves government work for private practice. After briefing, according notes made later by Rice, President Obama convenes Oval Office meeting with her, FBI Director Comey, Vice President Biden and Deputy Attorney General Sally Yates. The Steele dossier is reportedly discussed.  Comey later says Director of National Intelligence Clapper asked him (Comey) to do the briefing personally. Jan. 10, 2017: The 35-page Fusion GPS anti-Trump dossier is leaked to the media and published. It reveals that sources of the unverified info are Russians close to President Putin. Justice Dept. inspector general announces review of alleged misconduct by FBI Director Comey and other matters related to FBIs Clinton probe as well as FBI leaks. Jan. 22, 2017: Intel info leaks to Wall Street Journal which reports US counterintelligence agents have investigated communications between Trump aide Gen. Michael Flynn and Russia ambassador to the U.S. Kislyak to determine if any laws were violated. Feb. 3, 2017: A Russian tech mogul named in the Steele dossier files defamation lawsuits against BuzzFeed in the U.S. and Christopher Steele in the U.K. over the dossiers claims he interfered in U.S. elections. Feb. 9, 2017: News of FBI wiretaps capturingTrump national security adviser Lt. Gen. Michael Flynn speaking with Russias ambassador is leaked to the press. New York Times and Washington Post report Flynn discussed U.S. sanctions, despite his earlier denials. The Post also reports the FBI found nothing illicit in the talks. Feb. 13, 2017: Washington Post reports Justice Dept. has opened a Logan Act violation investigation against Trump national security adviser Lt. Gen. Michael Flynn. Feb. 14, 2017: New York Times reports that FBI had told Obama officials there was no quid pro quo (promise of a deal in exchange for some action) discussed between Gen. Flynn and Russian ambassador Kislyak. Rod Rosenstein, the Deputy Attorney General, becomes Acting Attorney General for Russia Probe. Its later revealed that Rosenstein singed at least one wiretap application against former Trump adviser Carter Page. March 10, 2017: Former Congressman Dennis Kucinich, a Democrat, steps forward to support Trumps wiretapping claim, revealing that the Obama administration intel officials recorded his own communications with a Libyan official in Spring 2011. March 22, 2017: Chairman of House Intelligence Committee Devin Nunes (R-Calif.) publicly announces hes seen evidence of Trump associates being incidentally surveilled by Obama intel officials; and their names being unmasked and illegally leaked. Nunes briefs President Trump and holds a news conference. Hes criticized for doing so. An ethics investigation is opened into his actions but later clears him of wrongdoing. March 2017: Sen. Charles Grassley (R-Iowa) writes Justice Dept. accusing Fusion GPS of acting as an agent for Russiawithout properly registeringdue to its pro-Russia effort to kill a law allowing sanctions against foreign human rights violators. Fusion GPS denies the allegations. March 24, 2017: Fusion GPS declines to answer Sen. Grassleys questions or document requests. thats why you have the leaking, she told MSNBC. April 3, 2017: Multiple news reports state that Obama National Security Adviser Susan Rice had requested and reviewed unmasked intelligence on Trump associates whose information was incidentally collected by intel agencies. April 6, 2017: House Intelligence Committee Chairman Devin Nunes recuses himself from Russia part of his committees investigation. April 20, 2017: Acting Assistant Attorney General Mary McCord resigns as acting head of Justice Dept. National Security Division. Shed led probes of Russia interference in election and Trump-Russia ties. National Security Agency (NSA) submits remedies for its egregious surveillance violations (revealed last October) to Foreign Intelligence Surveillance Court promising to no longer collect certain internet communications that merely mention a foreign intelligence target. The NSA also begins deleting collected data on U.S. citizens it had been storing. May 3, 2017: FBI Director Comey testifies hes mildly nauseous at the idea he might have affected election with the 11th hour Clinton email notifications to Congress. Comey also testifies hes never been an anonymous news source on matters relating to investigating the Trump campaign. Obamas former national security adviser Susan Rice declines Republican Congressional request to testify at a hearing about unmaskings and surveillance. May 8, 2017: Former acting Attorney General Sally Yates and former Director of National Intelligence James Clapper testify to Congress. They admit having reviewed classified documents in which Mr. Trump, his associates or members of Congress had been unmasked, and possibly discussing it with others under the Obama administration. May 12, 2017: Benjamin Wittes, confidant of ex-FBI Director James Comey and editor in chief of Lawfare, contacts New York Times reporter Mike Schmidt to leak conversations hed had with Comey as FBI Director that are critical of President Trump. Late July, 2017: FBI reportedly searches Paul Manaforts Alexandria, Virginia home. Sept. 13, 2017: Under questioning from Congress, Obamas former National Security Adviser Susan Rice reportedly admits having requested to see the protected identities of Trump transition officials incidentally captured by government surveillance. Oct. 17, 2017: Obamas former U.N. Ambassador Samantha Power reportedly tells Congressional investigators that many of the hundreds of unmasking requests in her name during the election year were not made by her. Nov. 2, 2017: Carter Page testifies to House Intelligence committee under oath without an attorney and asks to have the testimony published. He denies ever meeting the Russian official that Fusion GPS claimed hed met with in July 2016. Dec. 6, 2017: Associate Deputy Attorney General Bruce Ohr is reportedly stripped of one of his positions at Justice Dept. amid controversy over his and his wifes role in anti-Trump political opposition research. Dec. 7, 2017: FBI Director Wray incorrectly testifies that there have been no 702 surveillance abuses by the government. Dec. 19, 2017: FBI Deputy Director Andrew McCabe repeatedly testifies that the wiretap against Trump campaign official Carter Page would not have been approved without the Fusion GPS info. FBI general counsel James Baker, who is himself subject of an Inspector General probe over his alleged leaks to the press, attends as McCabes attorney. McCabe acknowledges that if Baker had met with Mother Jones reporter David Corn, it would have been inappropriate. Jan. 4, 2018: Sen. Charles Grassley (R-Iowa) and Sen. Lindsey Graham (R-S.C.) refer criminal charges against Christopher Steele to the FBI for investigation. Theres an apparent conflict of interest with the FBI being asked to investigate Steele since the FBI has used Steeles controversial political opposition research to obtain wiretaps. Jan. 10, 2018: Donald Trump lawyer Michael Cohen files defamation suits against Fusion GPS and BuzzFeed News for publishing the Steele dossier which he says falsely claimed he met Russian government officials in Prague, Czech Republic, in August of 2016. Jan. 11, 2018: House of Representatives approves governments controversial 702 wireless surveillance authority. The Senate follows suit. President Trump signs six-year extension of 702 wireless surveillance authority. Jan. 23, 2018: Former FBI Director Comey friend who leaked on behalf of Comey to New York Times to spur appointment of special counsel is now Comeys attorney. Jan. 27, 2018: Edward OCallaghan is named Acting Assistant Attorney General, National Security Division. Feb. 7, 2018: Justice Department official David Laufman, who helped oversee the Clinton and Russia probes, steps down as chief of National Security Divisions Counterintelligence and Export Control Section. Fri. Feb. 23, 2018: Former Trump campaign aide Rick Gates, pleads guilty to conspiracy and lying to investigators (though he issues a statement saying hes innocent of the indictment charges). The allegations and plea have no apparent link to Trump-Russia campaign collusion. Copy, cut and paste this one to my desktop. Sharyl is one of a kind. Honest. Thorough. Detailed. This list is unbelievable. Great source of information. It’s all here. Must-read ping. Wow! Real crimes being committed there. Sharyl is doing great work. “2011— Intel officials also begin storing and entering into a searchable database sensitive intelligence on U.S. citizens whose communications are accidentally or incidentally captured during surveillance of foreign targets. The database was pretty full by then. And when they left, they took it with them. Jarrett and Brennan are the keepers, till today. Imo. That’s why so many pubbies remain silent, or retired. Dems have been doing it blatently since Hillary got those 2000 FIB files. It’s what they do. Spread it around! When it hits 150, it gets moved to the main petition page. Then it will take off. Up to 106 now. Great timeline, thanks! Love this little blurb that the media likes to ignore. The President has good reason to hate McCain, dying or not. All are traitors who started this Russia Collusion ruse. Revolting that the Goebbelsmedia constantly lies and hides the truth about this coupe attempt. Ping to read again later. This is quite the eye opener for me even knowing many of the later details. The early details point to a possible Ukranian origin of the Trump-Russia collusion narrative and fraudulent FBI investigation. I previously thought it was British but they came into the picture later. Atkinson did great work. The other two links she cites are liberal garbage, and leave out pertinent details (as in Carter Page was an FBI plant who was installed in order to help frame Trump). "Summer 2015: Democratic National Committee computers are hacked." Not "hacked." Seth Rich was appalled by the DNC and Hillary cheating against Bernie Sanders, and also by their other crimes. Rich used a flash drive to download the files, and this took only a matter of minutes. Rich then turns the files over to Julian Assange. The DNC, including John Podesta, Debbie Wasserman-Shultz, Barack Obama, and Hillary Clinton learn that Rich was the one who took the files. 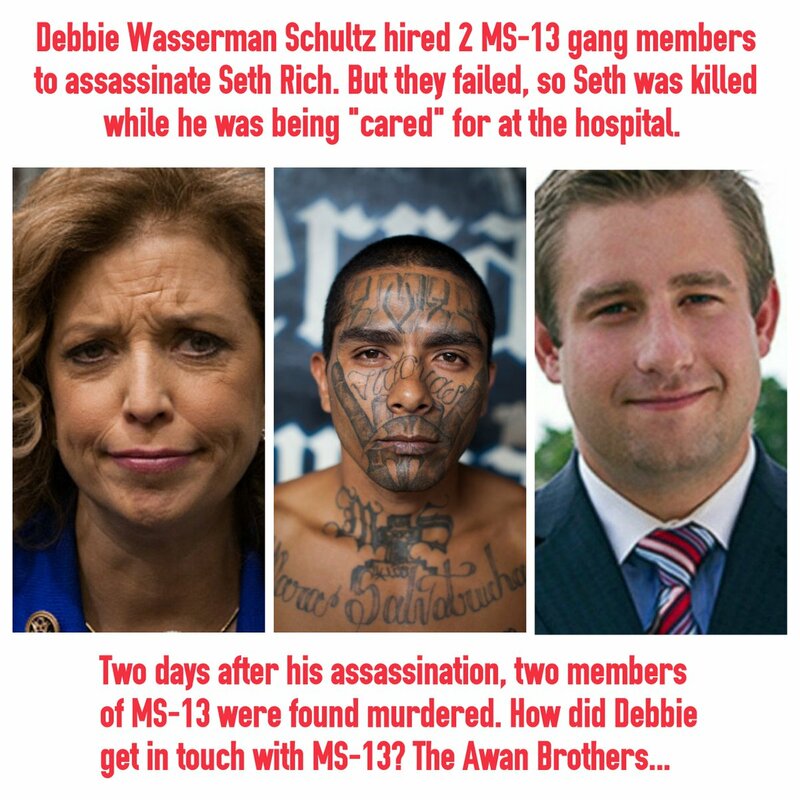 The DNC hires two MS-13 gang members to murder Seth Rich, who is shot on a DC street corner. The two MS-13 agents are in turn murdered in an attempt to cover all tracks leading back to the Obama, Hillary, Podesta, and the DNC. Rich does not die right away, but survives in a hospital room. Another assassin was most likely brought in to finish the job. "April 2016: Theres a second breach of Democratic National Committee computers." Is that blog some kind of democrat propaganda, brought to us by the same imbeciles that foisted upon us the bogus barry seotero birth certificate? "October 1999: Trump leaves the Republican Party and enters the 2000 presidential race as a Reform Party candidate, using Twitter as a way to try to build support. Stone is his political director."